I think you should have a Cinco de Mayo party! Wouldn’t that be fun? Even if you’re not up for hosting a bunch of people next Saturday night, you at least need to prepare some delicious Mexican-inspired food for your family. Who needs to go to the local overcrowded Mexican restaurant and eat greasy, over-sauced, heavy food in the presence of too many inebriated partyers? Not me, friends! 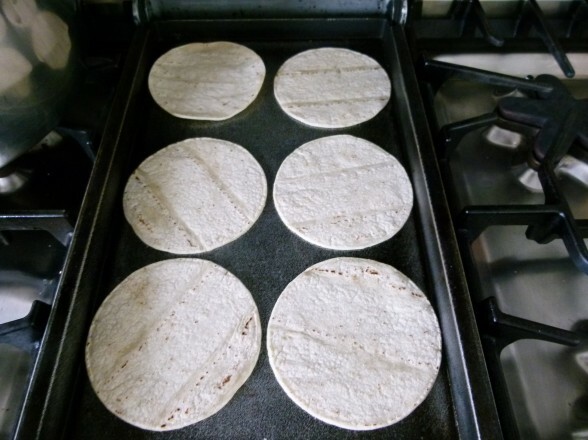 Although I don’t need it to be Cinco de Mayo to make Mexican food. My family requests Mexican about as much as anything else and I am happy to oblige with fresh, healthful and easy-to-prepare recipes. The Mexican dishes I like to make and eat are perfect for busy weeknights, but even better for entertaining because they’re always crowd pleasers and often it’s all about the toppings and allowing everyone to make their own. I love this for many reasons — it gives kids more control in what they’re eating and really encourages them to try new things, it’s less work for me, and it’s fun! One of my favorite Mexican dishes is fish tacos. Not only do I make them all the time at home, but I find myself ordering them whenever I can especially on vacation (what vacation?). I’ve been known to eat fish tacos every single day for a week and not tire of them. I love changing the toppings each time to keep it different. Sometimes I’ll even use a Savoy cabbage leaf instead of a corn tortilla. In my house we’re split down the middle as to the preferred fish preparation, so in my classes this month and on my blog post, I decided to demonstrate two delicious methods. I prefer a lime juice-based marinade and my husband likes the dry rub better, but you can’t go wrong with either. Where you can go wrong is not putting together a great assortment of condiments, because this is the KEY to building a perfect fish taco. 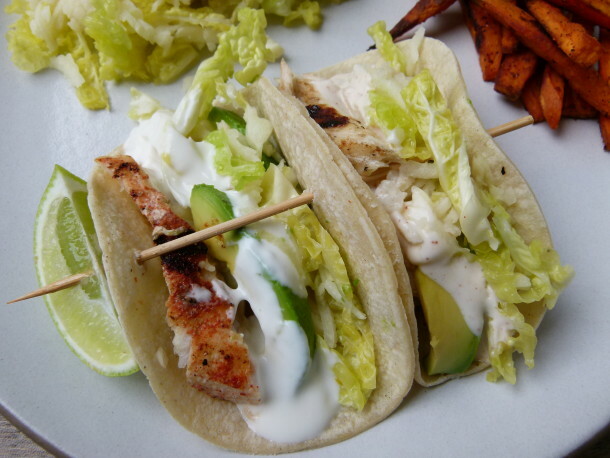 creamy: I personally can’t even eat a fish taco without the white sauce I’ve shown here and/or some sliced avocado or guacamole. crunchy: thinly sliced cabbage or a firm lettuce, even a good slaw like this Cilantro-Lime Slaw. spicy: even just a little kick makes it better. Try adding a little heat to your sauce, slaw, dry rub or salsa. tangy: a tart, acidic flavor helps keep everything fresh and balanced. You can squeeze fresh lime over everything or incorporate it in a marinade, slaw or salsa. I am excited to share a few more great Mexican-inspired recipes next week in hopes to inspire you to enjoy your own fiesta at home! Whisk together ingredients for white sauce and refrigerate until ready to use. Combine lime juice, oil and cumin in a shallow nonreactive dish small enough to just hold the fish. Add fish and turn to coat in the marinade. Season with salt and pepper and marinate fish at room temperature for 30 minutes. 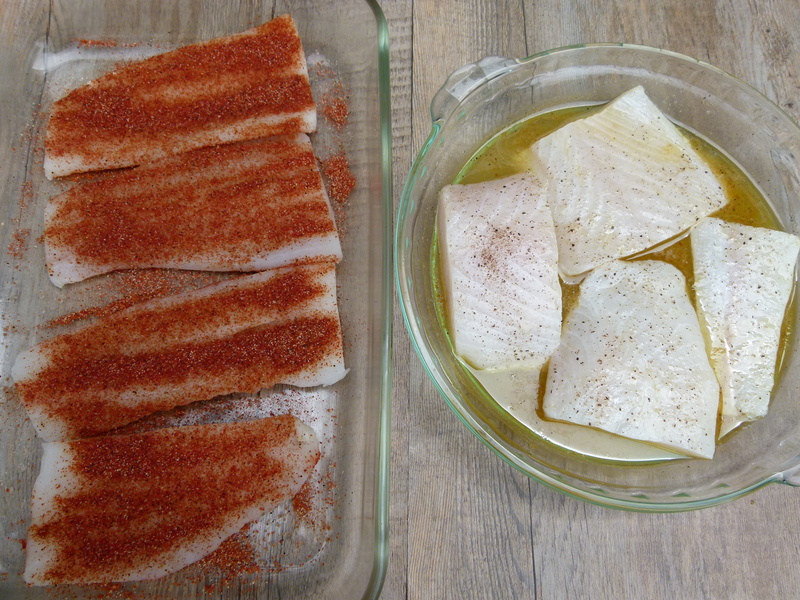 OR mix dry rub spices together and sprinkle on both sides of fish. Preheat grill to medium-hot. Brush grill grate with oil. Grill fish until just cooked through, about 3-5 minutes per side. Break fish into large pieces. Fill tortilla with fish and desired accompaniments. 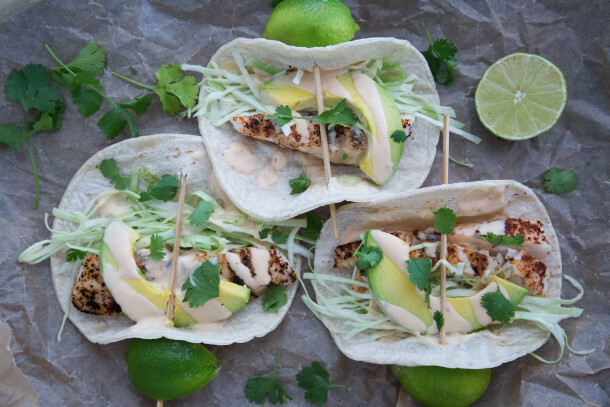 Drizzle with white sauce and squeeze fresh lime wedges over tacos. Hi Pamela — I can’t find the white sauce mentioned — can you direct me to that? this long weekend I made your meatballs, and eggplant lasagna–then my first roast pork all on Friday night, so I could have 2 days off. all twelve of them commented on the great flavour of the meatballs,,i got wow reviews on the lasagne from 8 of the twelve,,you know what the other 4 wanted…where’s the meat? 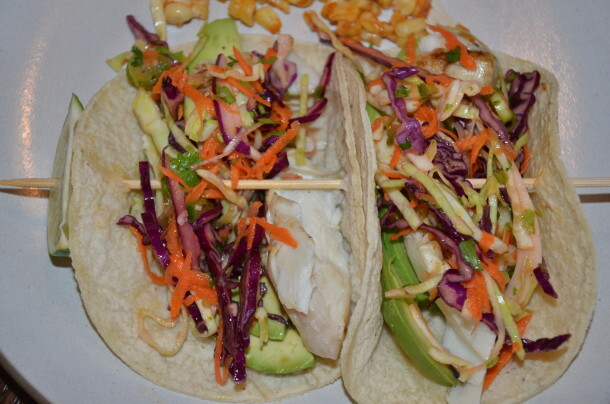 I am making your little fish tacos tonight with your cilantro coleslaw for a fun theme. I am nervous. the kids need to be able to touch vegetables-they don’t eat any at all. they don’t even know what coleslaw tastes like. my question to you is-the dad doesn’t want me to barbecue the fish on his barbecue, because it will make a mess-I will bake it then,,i am using your dry rub,,~how long at what temp? Shoot, I fear I am not getting back to you in time! 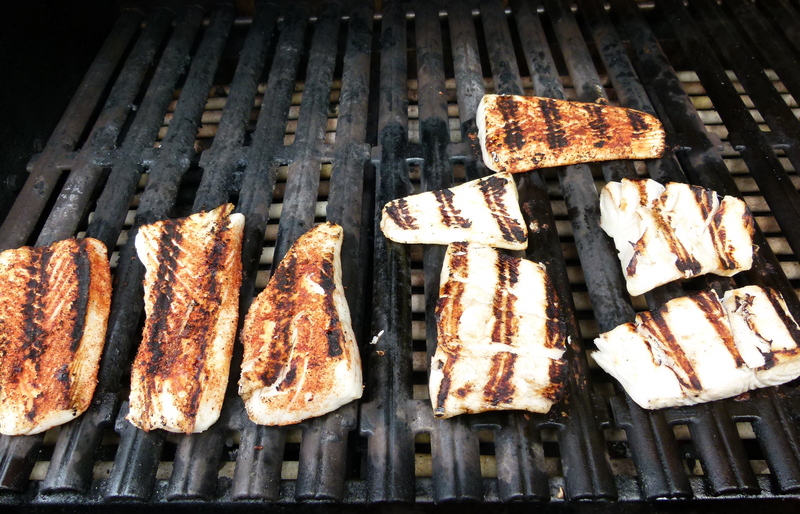 You can bake fish at 400 degrees until it starts to flake, about 10 minutes for a piece of halibut or mahi maui. I am cooking for a crowd this week as well — fun stuff! its ok,,you have given me enough confidence that I just faked it. I baked the halibut at 375 15 min==alittle wet but very tasty with the dry rub. everyone ate everything,,even the coleslaw!!! this is a dream come true for me,,your recipes and experiences are making my life seamless. I do read your wee stories and I do cringe for you…from a cooking world..~ not LOL . I put the tacos in a crunchy shell and then cemented a soft shell around it with melted cheese. the kids loved the crunchiness with the soft shell holding it together. the white sauce seemed to disappear! I am not kidding-there is not a crumb of anything left. all of you moms–try these! I am hired to cook their meal for dinner, 5 nights a week. so, no, all 8 of them eat and in 15 minutes they are gone. I do have a question..I used your rub on the fish,,but when I put it in the cookie pan in the oven it became quite wet..it still tasted delicious-but, should I have put it in the oven differently,,on a tray, so it would be drier like the barbecue? Good to have a sense of humor! Make sure the fish is dry before you put the rub on. Then you can sear one side if you want and finish it off in the oven or broil it on a broiler pan until done. If your fish was very wet to start it will leak a little liquid which, on a cookie sheet, will have no where to go. Hope that helps! I post what I serve your ecipe with-because that is one of the most difficult parts of the meal for me,,what do I serve it with? I noticed other ladies have mentioned their side dishes and I have simply copied their suggestions, instead of brainstorming myself-thank you ladies! is this ok to do on this site? let me know and I will happily adjust. what a superb recipe to the taste buds and for ease in prep. I just discovered you today looking for Citrus Scented Quinoa. Have spent the last 45 minutes drooling over your recipes and laughing at the articles. Mr. Picky’s letter was wonderful but what kind of camp serves bowls of powdered sugar for sprinkling!?! I plan on trying a bunch of these recipes, not the least of which will be the Shrimp, Tomato and Spinach and the Fish Tacos, which I am also addicted to. Thanks for being so interesting and healthy! Welcome, Mimi! Thanks for your thoughtful comment and I hope you do try many of the recipes. Would love your feedback if you do! Funny, about the camp — Mr. Picky was just asking me yesterday if he could go back. I’m sure the breakfast is a draw. Thanks for your feedback, Dan. The dry rub seems to be the more popular of the two. We made these last night with fresh Mahi Mahi from the Pacific! Neil said they were the BEST fish tacos EVER! We made guacamole, crunchy slaw, and the white sauce! YUM! I will be asking you about some different fish we have in the freezer when you get back form France! Disappointed with Wahoo’s? They make the best fish taco on the West Coast. They keep it really simple, just the basic ingredients. My mouth waters thinking about their fish taco. I crave it. And trust me, I am a lover of fish tacos, I’ve gotten them at a lot of places. I know Rubio’s serves up a good fast fish taco too, but I prefer the grilled simplicity of Wahoo’s. I’ve been to Wahoo’s maybe a hundred times, and the only thing I’ve ever ordered is the fish taco plate. We’re trying your recipe tonight, but I just thought I’d say how much I love Wahoo’s, there’s a reason they’re so popular and the original Southern California fish taco. Thanks for writing in as I totally welcome a difference of opinion here! To be fair, I’ve only tried the fish taco at the Wahoo’s in Manhattan Beach. In my area I think the fish tacos at Simmzy’s and Fish Grill are better. Personally, I can’t do cheese on a fish taco and Wahoo’s served it with that plus salsa and lettuce. Eh. Since I am crazy about fish tacos, I’d love to hear your other favorites! Delicious. My family loved this. My youngest (picky eater) made rolled fish tacos out of it and then ate the veggies on the side. Thanks for another great recipe. I’m so happy , Renee! More yummy Mexican recipes to come! I used pickled radishes with them on Sat. it was soooo good! Never made pickled radishes myself, only eaten them in a restaurant. But they were off the charts in a fish taco! I think I’ve made these 5 times since class and everyone, including my 6 year old loves them! 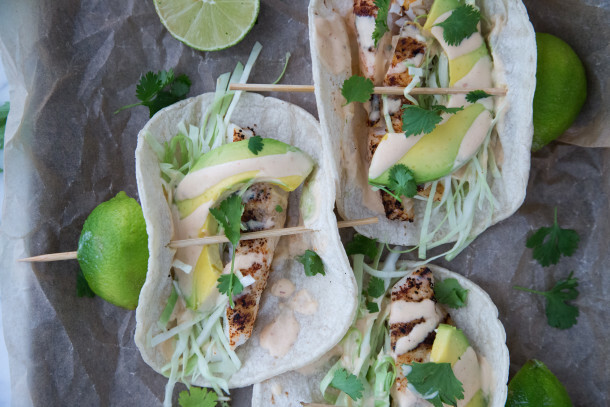 She says that have to try it her way – which is a tiny bit of fish & a bunch of avocado on the tortilla… I personally love the white sauce (it definitely takes things over the top!) with the marinaded fish – so yummy, quick and easy! Thanks for this amazing recipe – definitely one of my favorites! 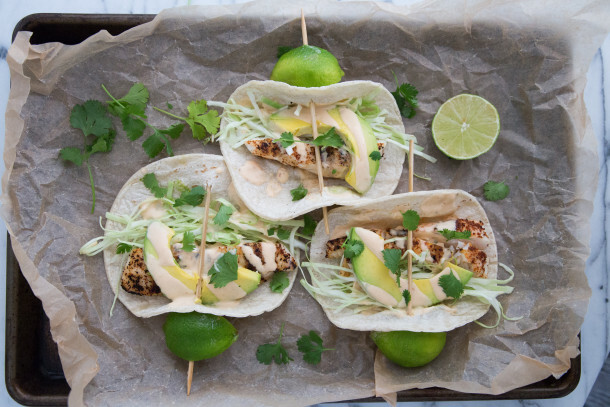 Love fish tacos and can’t wait to try these! Thank you for such a beautiful recipe. Please let me know if you make them, Diana! The hubby and I made these for dinner last night and loved them! We grilled mahi mahi using the marinade and shrimp using the rub. The shrimp barely made it to the table! Extremely tasty, satisfying, and healthy with enough variety for everyone’s liking. Bravo! I’m so glad, Diana. Good call on the shrimp! You’ll make these again and again. I made these last week (the dry rub) and it was a big hit. It literally took minutes to prepare and was so delicious. Thanks for another great recipe. Thanks Sunni! You aren’t exaggerating either — minutes to prepare! These sound delicious. We don’t like mahi mahi and even frozen halibut is frightfully expensive now. What other locally available fish would you recommend? Crappie or bass is great to use for fish tacos. We use halibut if we have any left from our Alaska fishing trip but if not we always have crappie in the freezer! Fish on!! Thanks for the great suggestions! I’ve never heard of crappie, but the fish I used here was frozen, wild Alaskan halibut from Costco. $39.99 for a 2-pound bag. It’s really fresh-tasting and half the price of local markets. I made these last week after class. Everyone loved them–even my super picky son. He seems to be willing to try anything in a tortilla. I did the rub and it took about 2 minutes. I didn’t have any mayonnaise so I left it out and the sauce was still good. Thanks for another great recipe!